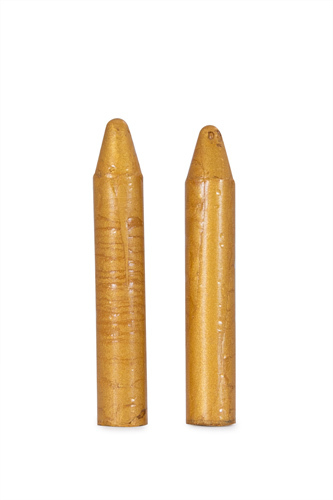 Gold crayon for filling in worn trademarks. Makes the overhaul jobs really look good. Clean out engraving using a needle spring to remove dirt and debris from deep in the crevasses. Scuff crayon into grooves by going across at 90 degree angle to the groove. When cool, use a rag and a ruler to slide off the excess and your engraving will be renewed. If some gets into the grain, just take a few extra moments and pick it out. very effective, does what it is supposed to do.